Fenway is a baseball park in Boston, home of the Red Sox, eight time World Series winners . Boston Public Schools, the oldest public school system in the US, operates 145 schools. Longwood Medical and Academic Area, adjacent to the Fenway district. Massachusetts General Hospital recently achieved the accolades of being ranked #1 in the Nation as America's Best Hospital. Logan Airport, located in East Boston and operated by the Massachusetts Port Authority (Massport), is Boston's principal airport. The Massachusetts Bay Transportation Authority (MBTA—known as the "T") operates the oldest underground rapid transit system in the United States and is the fourth busiest rapid transit system in the country with 65.5 miles (105 km) of track on four lines. The MBTA also operates busy bus and commuter rail networks, and water shuttles. Amtrak's Northeast Corridor and Chicago lines originate at South Station, which serves as a major intermodal transportation hub, and stop at Back Bay. Fast Northeast Corridor trains, which serve New York City, Washington, D.C., and points in between. Fenway Park, near Kenmore Square, is the baseball park of the Boston Red Sox. The TD Garden, is adjoined to North Station and is the home of three major league teams:the Boston Blazers of the National Lacrosse League, the Boston Bruins of the National Hockey League; and the Boston Celtics of the National Basketball Association. The Public Garden, also known as Boston Public Garden, is a large park located in the heart of Boston, Massachusetts, adjacent to Boston Common. 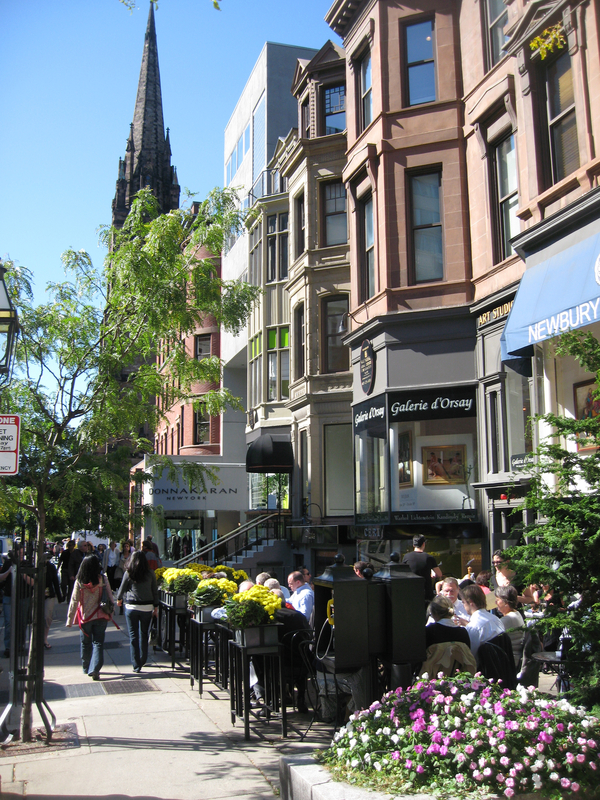 Newbury Street, located in the Back Bay area, is a Bostonian hotspot as the location for numerous restaurants, hotels and shops. Boston has a large selection of awe inspiring museums, whether you are looking to expand your knowledge of the living world at the Boston Museum of Science, or emerse yourself in art at the Museum of Fine Arts or at the Isabella Stewart Garden Museum. Bring the kids in for a day of fun at the New England Aquarium, which has just completed a renovation that has renewed its main building to the core, and the iconic Giant Ocean tank has undergone a top-to-bottom transformation. Take a walk on the Freedom Trail, a 2.5 mile, brick-lined route that leads you to 16 historically significant sites. En route stop in the Boston's North End for a cannoli at the renown bakery, Mike's Pastry. Faneuil Hall was rated number 4 in America's 25 Most Visited Tourist Sites by Forbes Traveler. Boston's South End is home to elegant Victorian brick row houses, many dating from the 1800s, and one of the most diverse populations in Boston.Some of the city's finest dining can be found lining Tremont Street and the arts shine at the Boston Ballet, and at the Boston Center for the Arts. To fill your shopping needs, visit the Copley Place Mall, Boston's distinctive shopping destination housing 75 stores. The upscale center includes two levels of shopping, restaurants, four office buildings, 1,400 parking spaces and two hotels, The Westin Hotel and The Boston Marriott Copley Place. Take a walk along the historic Charles River Esplanade where you can rent a sailboat at the Community Boat house, watch a number of concerts at the 'Hatshell', or pay witness to the anual Head of the Charles Regatta. To experience classical music at its finest, visit The Boston Symphony Orchestra which is one of the country's five major symphony orchestras commonly referred to as the "Big Five".